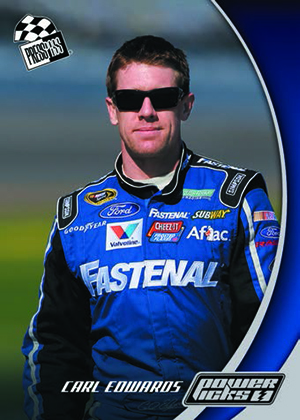 With the NASCAR season in full swing, 2013 Press Pass Ignite Racing is the first release of the year to include racers with their updated uniforms. 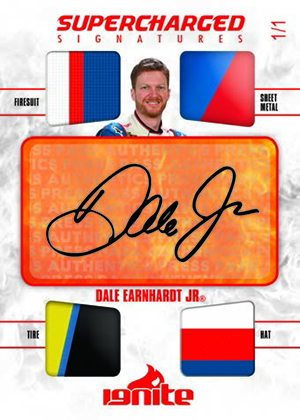 Bolstered by a variety of inserts, autographs and race-used memorabilia cards, the release has a little bit of everything for racing fans. 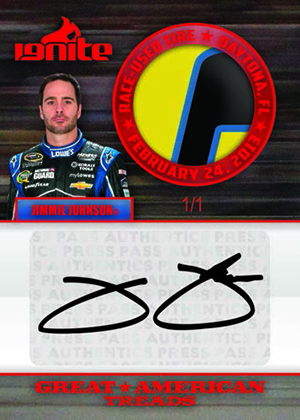 Every 2013 Press Pass Ignite Racing hobby box comes with at least one autograph and one memorabilia card. Every half-case includes a box that has a bonus hit. 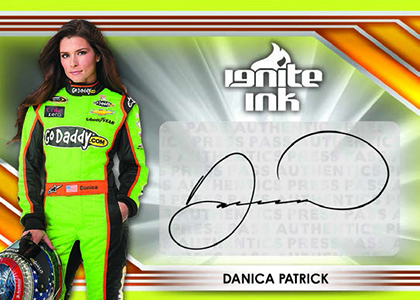 Ignite Ink feature autographs from top NASCAR drivers, including Danica Patrick. These come in three levels of rarity. Supercharged Signatures have an autograph that' surrounded by four different pieces of race-used relics. As usual, Press Pass uses swatches from many different pieces of driver-worn gear as well as car pieces. Another example of this is Great American Treads, which combine a signature and a tire piece from the Daytona 500. 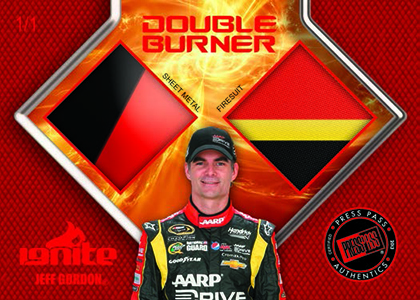 Other memorabilia sets include the firesuit-infused Hot Threads and Double Burner dual-swatch cards. 2013 Press Pass Ignite hobby boxes also come with a handful of basic inserts. 2013 Hall of Fame Inductee cards fall one per box. 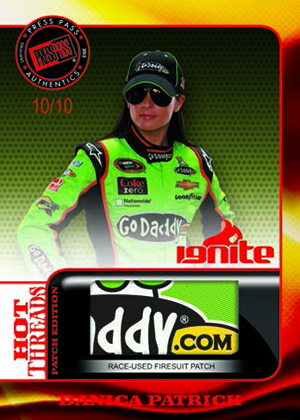 Danica Patrick's historic pole position at Daytona is commemorated with a special card that's inserted every half-case. There's also a special Davey Allison Tribute card. Other inserts include Convoy, Profile and Turning Point. Press Pass' Power Pack program returns, which gives dealers special promo packs as an incentive for pre-ordering. 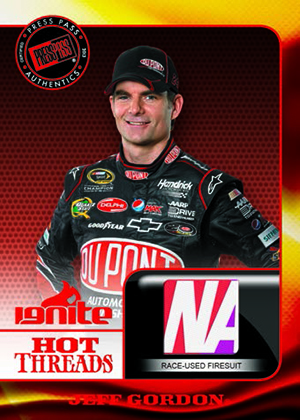 Each Power Pack comes with an exclusive base card as well as a Jeff Gordon Hot Threads firesuit card not available anywhere else. 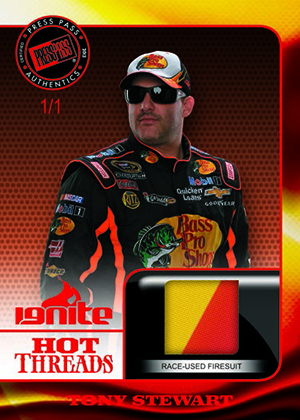 Click here for the 2013 Press Pass Ignite Racing checklist.